Imagine yourself walking down the beach and finding a decorative stone or two. You look at it and smile – the sentiment bringing warmth to your heart. “Believe”, “Wish”, “Love”. You keep walking but leave the stone behind. A few feet further and you find another. The color catches your eye this time and you can’t help but pick it up. Perhaps it’s the Red Phoenix (😉). Perhaps it’s a heart. Maybe a beautiful word of “Hope”. Whatever image is there, you hold that stone and stare deeply at it. You feel the love that went into each stroke and the tears begin the fall. Walking away, you take the stone with you…feeling it’s presence, the love that it filled you with. It is exactly what you were looking for that morning. It was exactly what you needed to find. My aunt and her family have started creating these amazing stones. She walks regularly in a beach up north and finds beach stones along the way. Her family collects them and brings them home to paint and leave behind at their next visit. 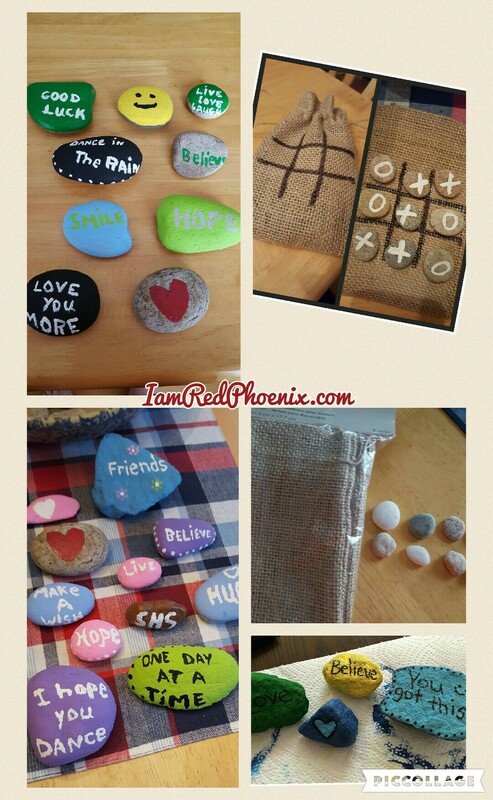 She even recently started making small chemo bags out of burlap sacks and painting rocks to match tick-tack-toe boards to give away.